Well as a matter of fact, you naysayers (I know, I'm like 64), I have gotten a lot of use out of them! Now I haven't been living here too long, but I feel like it's actually been relatively rainy for the area. So there. Purchase: justified. This remark was met with a couple raised eyebrows and a Google image search. Here. You can be the judge, but I think my boyfriend is officially the biggest nerd/dork/geek ever. 70s Donald Sutherland, on the other hand... that I can get on board with. hi i just found your blog and it's adorable! your style is so cute and i love the pasta and veggies you posted in your last post. i can't wait to keep reading! that red jacket is simply beautiful! your rainboots are so cute! they should come to good use for this rainy weekend! oh man those rain boots are adorable! It almost helps make up for the crummy weather. Beautiful look, the trench and the boots are fantastic pieces!!! 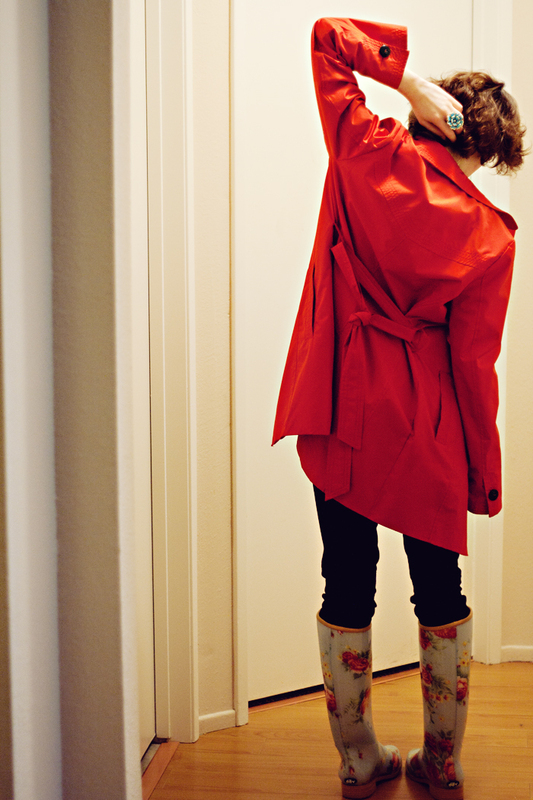 I've just fallen madly in love with your coat, not only because its red but because you wear it so well!